OK – so this post may make some of my fellow Northern hemisphere bloggers slightly jealous, but sorry I am in the “back to work” doldrums. My Christmas Summer holidays are over and it is back to the desk in the middle of a Sydney Summer. It seemed like it went so quick! Christmas day was very wet, we belted the poms in the cricket to win back the little urn and restore balance to the force (for non-Aussies I will not translate this), and I got to take my family to the beach – several times! 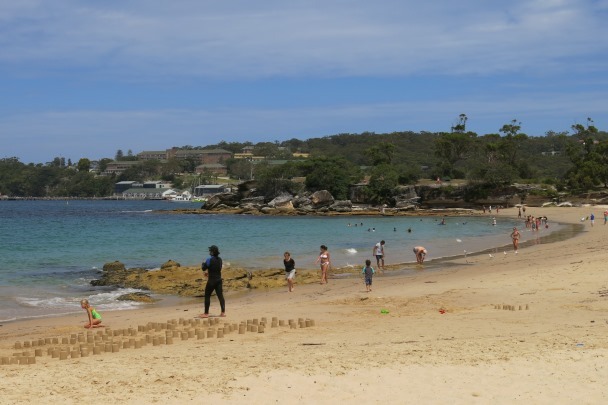 We are lucky in Sydney that we have a great selection of beaches to choose from. 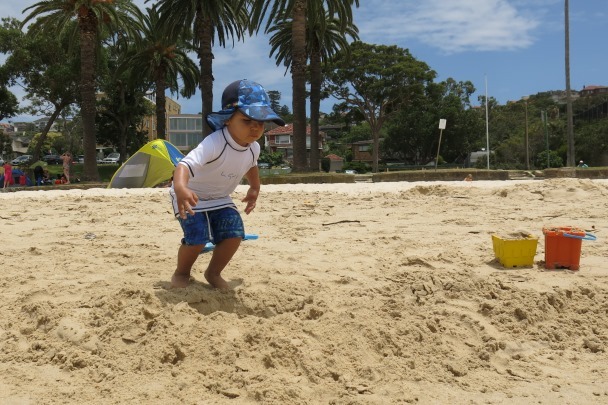 My favourite surf beach is Maroubra because it is not full of tourists, but with a 3 year old in tow our favourite beach would have to be Balmoral within Sydney Harbour. It is family friendly with minimal surf and easy to get to, the only downside being the limited parking (which may also be the blessing to stop it from getting overcrowded). And our boy loves it too! 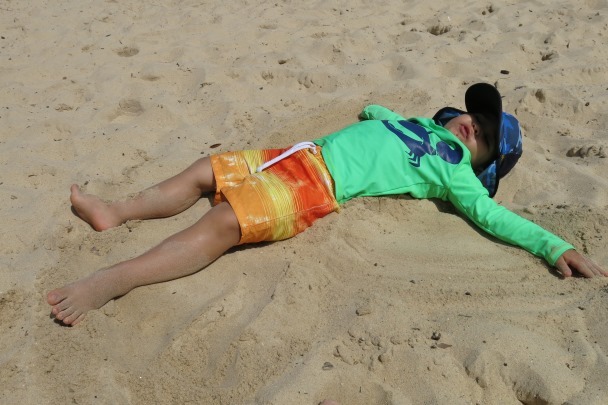 Whether he is pretending to be a starfish in the sand. Or jumping over the sinkholes that we have dug in the beach. Balmoral is a very nice stretch of sand and is very welcoming. Even for fellow beach goers trying to signal planes flying overhead with sand bucket writing. And camping out under the sun tent is the ideal location to get stuck into the snacks that would otherwise not be allowed at home. I have one more long weekend at the beach booked at the end of January, so hopefully looking forward to some more beach fun. It is the little travel trips that sometimes provide the best enjoyment. Nice one. He looks a happy chappy. Great news as well. He’s so adorable and he’s having such a great time! We think our little monster is adorable too. 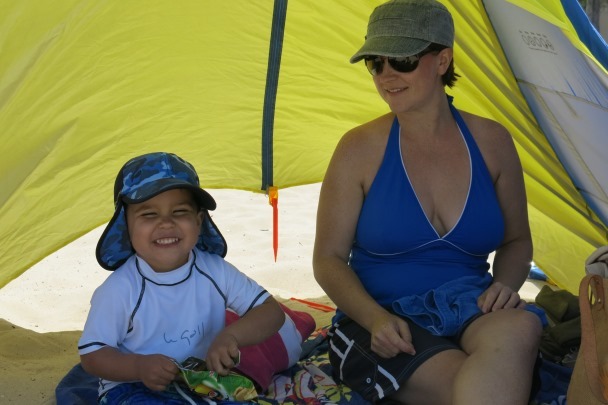 Thank heavens he loves the beach as much as his parents do! Brother, the windchill here last night was -30 (F). I don’t know what that translates to in Celsius because Google kicked back “Freaking cold” when I typed it in… 49 of our 50 states will have freezing temperatures tonight – not unheard of but VERY rare. Your post warmed me up a bit. Thank you. Holy mother nature, -30F is -34C! That is f#$@ing cold! 49 of 50 States? That would mean only Hawai’i is not freezing at the moment. Blimey! Exactly. It’s nasty bro. I almost wound up with frostbite shoveling my walk at the office… Fortunately I brought my balaclava but I only had a pair of leather gloves so my hands went numb then tingly… I was outside for 15 minutes.